Frankenmuth, Michigan is now known for being the home of one of the hottest rock bands on the planet, Greta Van Fleet. Greta Van Fleet has been touring the world, selling out venues one after the other, which is pretty impressive for a group of teenagers who were sitting in a high school classroom not that long ago. Oh, and the band has not even released a full-length album yet, but we’ll get to that a bit later. The fact is that Greta Van Fleet came along when the rock industry needed an injection of steroids. With the release of the eight-song EP, From the Fires, GTF didn’t just give the industry a boost, they bent the industry over and shoved a needle full of adrenaline-fused rock n’ roll right up the rock industry’s backside. The band may be the hottest group on the planet and GTF will play The Pageant on August 1st. Don’t worry about getting tickets, because The Pageant sold out in a matter of minutes. So, while 2,300 fans wait for the band’s eagerly-awaited return, here’s an interview with drummer Danny Wagner, who took some time out of his busy schedule, shortly before leaving for Japan to speak to ReviewStl’s Jeremy Housewright. How did you guys come up with the name of the band? So, it was one of those things that just kind of came up because the band needed a name. There was a little bit of pressure at the time. I wasn’t actually in the band at the time, which is funny. They had written down some names and none of them were working. So, the name Gretna Van Fleet, the town elder, popped up one day. It kind of bounced around a little bit and they decided to take the “N” out. It carries another meaning that we’ve learned about too as time has went on. It’s an attachment to Frankenmuth, where we are from. I have to ask about the Zeppelin comparisons. I’m sure you guys hear this all the time. Is that something you get tired of hearing about or are you proud of it? You know, it’s all context. For the most part, we take it very humbly. It really is, when you break it down, one of the best compliments ever. I mean, in the realm of rock n’ roll, they are the catalysts and one of the bests at what they do. So, in a way, it’s a huge compliment. I’d say the one comment to that is, we share a lot of similar influences with them as well. They come from a house of a strict blues family and I grew up with a lot of folk and that’s kind of how the sound came out. That leads me to my next question. What are some of your musical influences? Me, personally, I listen to a lot of The Who and Jimmi Hendrix. If you could pick any band to tour with right now, is there one that would stand out for you to choose? I’ve always been a huge fan of Paul McCartney. I’ve been a huge Beatles fan my whole life. One would be the Foo Fighters. That would be really awesome and quite the opportunity. Thinking about touring, what are some things you do to keep yourself sane with such a grueling touring schedule? I’m a huge golfer. I love to golf. I take my clubs on tour. That’s one thing I like to do personally. As far as the band goes, we all love the arts. We love drawing, we love reading, we love hiking. It’s pretty endless. What is it like touring outside of the U.S? What are some of the biggest differences you’ve noticed culture wise compared to the U.S? You travel to all these places and you get to experience the different cultures and they are so different and you live in them for a little while. It makes home feel so much more like home. It’s weird, you really start to appreciate your country more when you’re not in it. Thinking about the EP, how long did it actually take you guys to put it together? Probably not as long as it should have. The newer EP, released in November, took maybe 2 or 3 weeks, but it took us going out on the road and realizing we probably needed to add some more. So, we came home for 2 and a half weeks or so. We came up with the ideas and recorded them. It was done, kind of in a time crunch. We’ve definitely spent a lot more time on the new album that’s not been released yet. Talking about the new album, what is the status of that? The original idea was to release it this summer, but we are pushing it back to the fall in October. No specific dates yet, but in the fall. In your live performances, are you playing any of the new material off of it? Yeah, we’re playing longer shows now, so we have to add more songs to the set. We have to play songs that may or may not be on the album. Were you surprised at how fast the band’s success came? Totally. I was blown away at how much attention the original four songs garnered. We were much younger and the level of professionalism in the band is much more now than what it was then. Everything has happened so quickly. It’s been quite the roller coaster, that’s for sure. What was it like being in high school and experiencing the success that the band was having? It was weird. What was weirder is Sam and I knew what was coming up in the next couple months with touring and stuff, but we didn’t feel like we could tell anyone because it’s just so tricky. It’s not the most fathomable thing. At the time we were very hopeful about it. If you weren’t in the band, what would you be doing? I’d be golfing. Before the record label signing and the success of the first record, I was planning on going to college and pursuing golf in some way or fashion. That’s my second love. Do you have a particular golfer you like to watch? I like a lot of the young guys. Rickie Fowler and Jordan Spieth are fun to watch. I’m a huge Dustin Johnson fans. I like watching it all. Given all the great things that have been said about the band, has that added any pressure on you guys with the next album coming out? I don’t know if I would say pressure. I would say encouragement. We don’t get nervous. We read and hear a lot of the comments and we take that and add fuel to the fire. It helps us rather than hinders us. Will the new album have the same sound as the EP? Yeah, it’s tricky because we’re finding our sound right now. Throughout the process, we have identified a sound that we have grown attached to. There is a new dimension to Greta Van Fleet’s sound, but it still carries that same energy as the EP. It’s the best work yet, I would say. How big of a role has blues music played into the band’s sound? Largely. I know when I joined the band, the first music I ever played with them was blues. Everyone knows blues and you could get a band together and just play for hours non-stop. That’s how we used to play. Blues was a big part of our families growing up. We learned a lot about performing and recording because of the blues, so in that respect it’s been a big part. For those who have not seen the band live, what would you describe a Greta Van Fleet show to be like? I would say we try to deliver as much physical energy as possible. We try to make it very uplifting and as aesthetic as possible. There are a lot of elements and dimensions to the Greta Van Fleet world. I think as the shows progress, you will start to see the dimensions that I’m talking about. But, right now, it’s an intense rock n’ roll show. We like to jam together and we communicate well together which is awesome. Greta Van Fleet will play The Pageant on August 1st. The show is sold out. 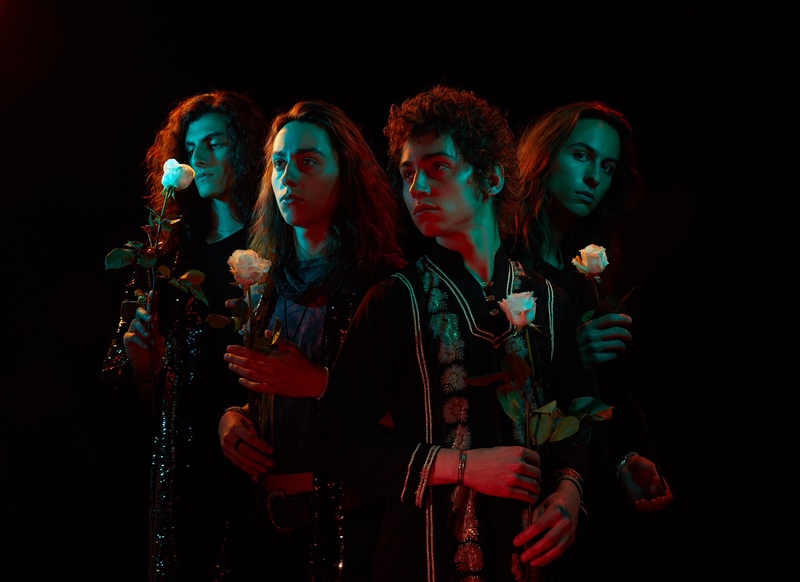 Greta Van Fleet’s new single, “When the Curtain Falls,” is out now. The band’s new album is schedule to be released in October.